Has gold already bottomed? Did we miss a great buying opportunity or will there be a better one ahead? Here is a look at three indicators (along with charts) that help narrow down the next best entry point. Following gold’s record setting decline, gold prices have rallied 10% and the (gold) dust is starting to settle. Does that mean the bottom is in for gold? The drop in gold prices was viewed as a buying opportunity by gold coin investors. The United States Mint sold a record 208,500 ounces of gold coins in April 2013 (data as of April 29). The only month investors bought more gold coins was in December 2009. Gold prices and the SPDR Gold Shares (GLD) dipped a bit lower in January and February and soared thereafter (see chart). A few years back the CBOE launched the CBOE Gold ETF Volatility Index (GVZ). GVZ measures the market’s expectation of 30-day volatility of gold prices by applying the VIX methodology to options on SPDR Gold Shares (GLD). GVZ works like a VIX for GLD. When the VIX soars, stocks usually find a bottom. 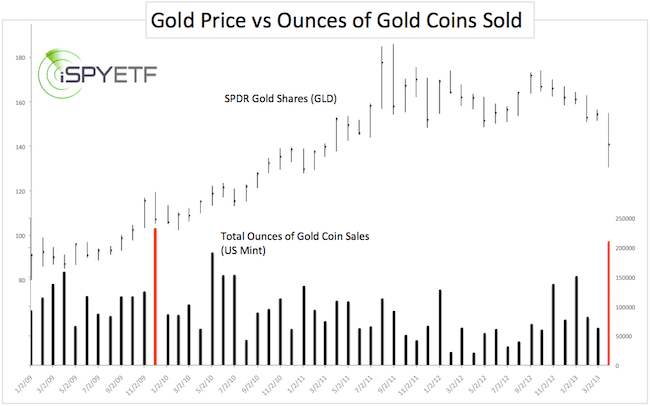 When GVZ soars, the Gold ETF usually finds a bottom. 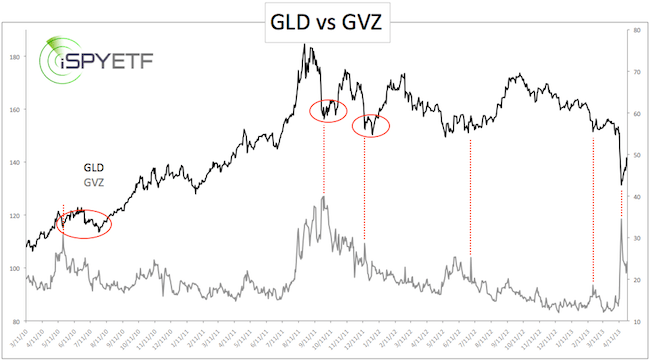 In mid-April GVZ spiked to the highest level since gold’s 2011 meltdown. This kind of volatility event tends to shake out a ton of ‘weak hands,’ but doesn’t always punctuate the final low. The red circles in the chart below illustrate that lasting lows frequently take the shape of a double bottom. Lasting price lows usually coincide with waning selling pressure. This creates a bullish RSI divergence (price makes a new low, RSI doesn’t). Ideally there should be a few days in between the RSI and the actual price low. At the April 16 low for gold, there was a small RSI divergence (one day difference between price and RSI low). Such small divergences can lead to larger scale lows (one example is the March low in 30-year Treasuries), but the absence of a clearly visible RSI divergence generally results in a price relapse and double bottom. The bar chart below shows gold prices in relation to RSI and various support/resistance levels monitored by the Profit Radar Report. Gold prices are currently pressing against triple resistance. 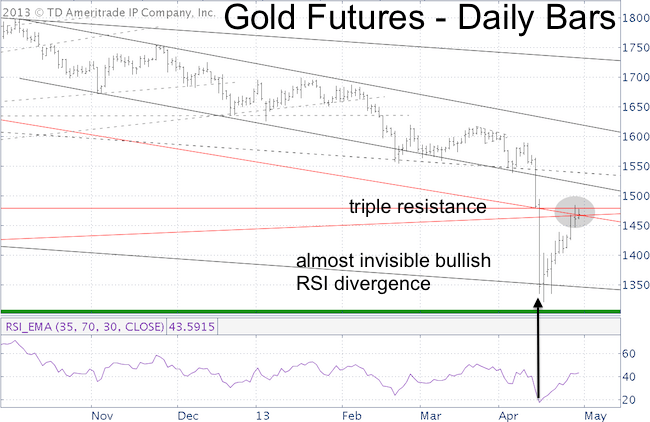 Sustained trade above resistance would suggest that gold is ready to rally further. Another dip to or towards new lows, however, would provide a much more attractive buying opportunity. Defensive sectors like health care, consumer staples and utilities have been on fire. In fact, health care and consumer staples are the two best performing industry sectors of the U.S. stock market. On paper, the strong showing of defensive sectors parallel to all-time stock market highs is odd. But let’s face it; the overall market action (meaning the QE bull market) is odd. Defensive sector outperformance may be a reflection of investor suspicion. After all, owning defensive sectors is one way to ‘throw your hat in the ring’ without actually going all in. To what extent are defensive sectors currently outperforming economically sensitive sectors? The lower portion of the chart below shows the ratio of Consumer Staples Select Sector SPDR (XLP) to Consumer Discretionary Select Sector SPDR (XLY). 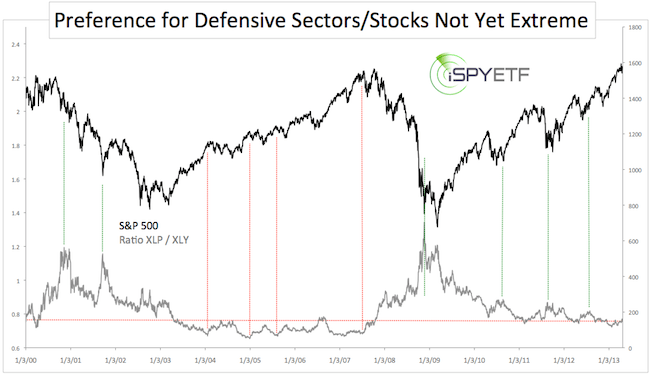 The XLP/XLY ratio is plotted against the S&P 500 (SPY). We see that extreme XLP outperformance (red lines) in the mid-2000s either held back the S&P or led to a major market top. Extreme under performance (green line) was generally seen towards meaningful market lows. Currently the XLP/XLY is more or less in neutral territory. 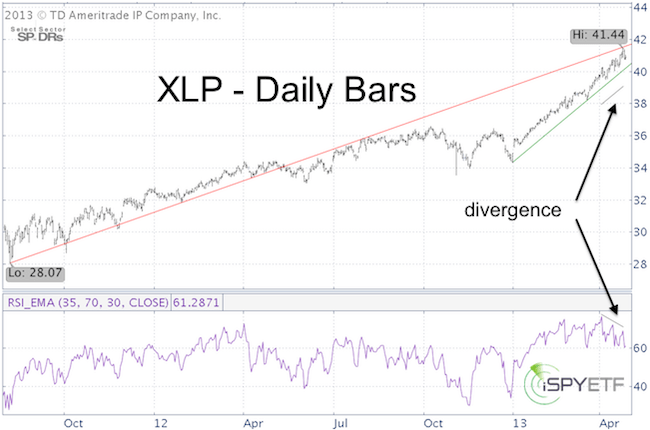 The second chart shows XLP’s 48.62% rally from the August 2011 low (since its corresponding October 2011 low the S&P 500 gained 47.63%). XLP nearly touched resistance going back to that low, but is trading above short-term trend line support. The behavior of RSI suggests a tired up trend. A close below green support would be the first sign of a correction. A close above the red line would likely reinvigorate consumer staples stocks. The ETF SPY provides FREE weekly trade set ups. >> Sign up for the free newsletter to get future ETF SPY ideas. >> Click here for a summary of prior ETF SPY set ups and overall bullish/bearish indicators. Bullish vs Bearish Indicators – Who Has the Upper Hand? Recent articles highlighted various individual indicators. Some were bullish, but the majority was bearish. This article reviews previously discussed signals and boils them down to one outlook. In recent weeks we’ve examined various indicators, studies, gauges and seasonality. Some bullish, some bearish. But what is the balance? Does the weight of evidence suggest higher or lower prices? Listed below is a summary of articles designed to help form an educated and balanced opinion. Articles are categorized as bullish or bearish based on their implications. >> click here to view all the links to prior articles. 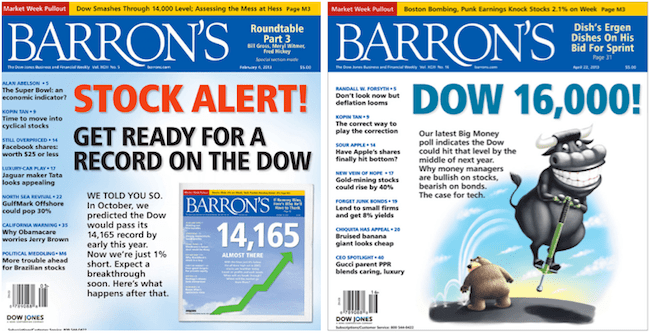 Barron’s Big Money Poll delivered the most notable sentiment extreme in 2013. Professional investors’ record bullish outlook is bearish for stocks. April 17: Did ‘Sell in May and Go Away’ Arrive Early? Based on consistent seasonality, the March 31, Profit Radar Report suspected a mid-April and May double top. The mid-April high is in and the ‘double top’ appears to be in the making. Falling precious metals prices often foreshadow weakness for stocks. Buying climaxes are a sign of distribution, which is bearish for stocks. Discussed in detail was a buying climax in particular for the S&P 500. The most likely outcome was a delayed (1-2 weeks) decline, which is what occurred. The ‘risk on’ trade has reached a level that’s caused trouble in the past. The lagging behavior and lack of leadership by ‘Big Tech’ suggested that the rally is starting to run out of steam. The Russell 2000 and S&P 500 bounced off major support. That’s bullish … as long as support holds. Option trader sentiment has established a solid track record as contrarian indicator. 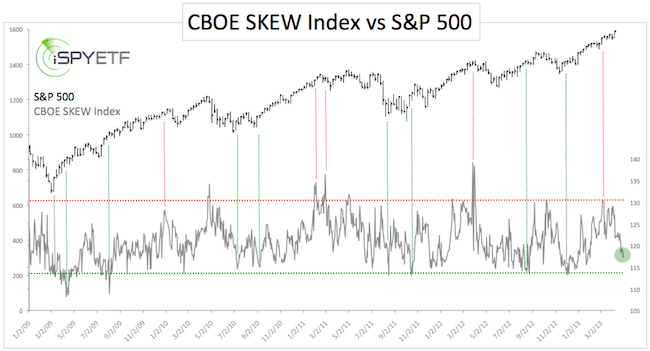 Contrary to the deeply complacent readings of the VIX, other option-based indicators (like the SKEW index) aren’t even close to bullish extremes. The most volatile of sentiment gauges fell to a bearish extreme. Viewed in isolation that’s bullish for stocks, but only viewed in isolation. Technicals highlighted key resistance at 1,593 and key support at 1,538. As per the Profit Radar Report, we went short the S&P 500 once the S&P 500 dropped back below 1,590 (April 12) and covered our short positions at 1,540 and 1,562 (April 18 and April 22). Based on the weight of evidence, there will be a short windon with a low-risk opportunity to go short. How to go short with minimal risk is revealed in the Profit Radar Report. Is Dow 16,000 possible. Sure. It’s less than 8% away from the April all-time Dow high. But, the mere fact that Dow 16,000 is predicted by one of the most followed money polls, suggests that (best case scenario) getting there won’t be easy. Risk is rising when leaders turn into laggards. After outperforming the S&P 500 for years, the Russell 2000 failed to confirm the S&P’s new all-time high on April 10. The stock market in general peaked the next day. Here’s an updated look at the Russell 2000 and the Russell 2000 ETF. We’ve been using the Russell 2000 Index as a ‘thermometer’ to see if the market is getting overheated. How can any one index work as a thermometer? As rallies or bull markets mature, investors typically find fewer and fewer stocks at a price tag that justifies buying. Mature rallies are therefore accompanied by selective buying. Selective buying is just a fancy expression for some indexes beginning to lag and underperform. High beta indexes, like small caps, are usually the first to be left in the dust. That’s exactly what happened in early April, particularly on April 10. The S&P 500 rallied to new all-time highs. The Russell 2000 did not. In other words, there is a low-risk opportunity to go short as long as the Russell 2000 remains below its all-time high (recorded on March 15). The purple bar in the chart below highlights the difference between the April 10 and March 15 highs, seven points. The risk of going short on April 11 was seven points. So far the Russell 2000 has fallen as much as 48 points. This is a risk/reward ratio of almost 7:1 in your favor. On Thursday the Russell 2000 closed right above important triple support. Although RSI (bottom of chart) did not yet confirm the new price low, it failed to provide an obvious bullish RSI divergence. This suggests that any bounce at current support will lead to at least one more leg down. A move below 890 should minimally lead to a test of 868, possibly lower. The second chart shows the same support levels for the iShares Russell 2000 Index ETF (IWM). IWM already closed below the two ascending trend lines. Once price drops below support it turns into resistance (that’s why the trend lines are colored red). 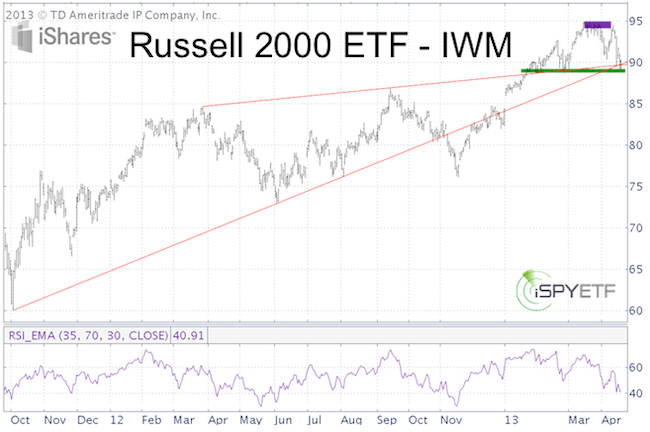 IWM may foreshadow what’s next for the Russell 2000, but when it comes to trading/investing, I base my technical analysis on the purest representation of the respective asset. The purest representation of the Russell 2000 is the Russell 2000 Index, not the Russell 2000 ETF. 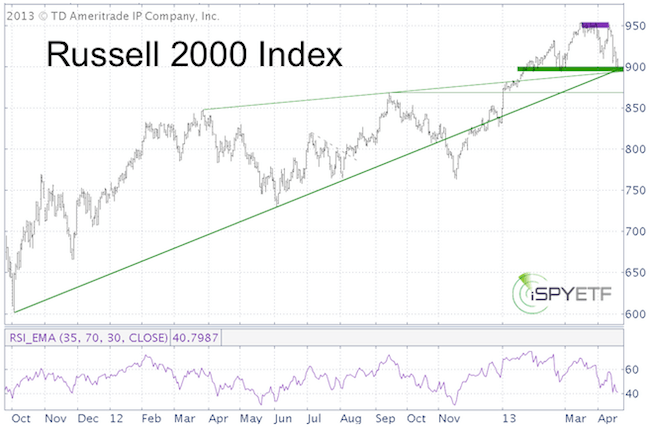 Nutshell summary for IWM: Based on trend line support for the Russell 2000 Index, small caps are likely to find support around current prices, but should ultimately move lower before embarking on a more sizeable rally again. April 12: GDX broke through support with a vengeance. A new low is likely before we’ll see a significant rally. April 5: XRT closed below trend line support and registered a failed bullish percentR low-risk entry (lingo for: the up trend is likely broken). XRT is still trading above support at 68.70. March 15: XLF trades as high as 14.65, which was right in the 18.52 – 19.66 resistance cluster that was likely to halt XLF’s rally. March 7: The Nasdaq-100 (corresponding ETF: QQQ) had two open chart gaps: 2,806 and 2,860. Although it seemed unlikely at the time, the Nasdaq-100 closed the gap at 2,860 on April 10 before declining well over 100 points. Did ‘Sell in May and Go Away’ Arrive Early? When you look at this chart you’ll inevitably say: “Why didn’t I think of that?” Sell in May and go away worked for five years in a row. But when it’s too obvious, it must be wrong, right? Here are the S&P 500 trigger levels that suggest seasonal May weakness arrived early this year. Below is a detailed analysis of the bearish April/May seasonality originally published by the Profit Radar Report on March 31, 2013. “Forecast for the month ahead: Investors Business Daily just inquired about my 2nd quarter ETF pick. I expect the 2nd quarter to be a tale of two markets, so coming up with one pick was a tough assignment. Click here to read the Investors Business Daily write up. Why a tale of two markets? The chart below highlights a pattern that played out in 2008, 2010, 2011 and 2012. 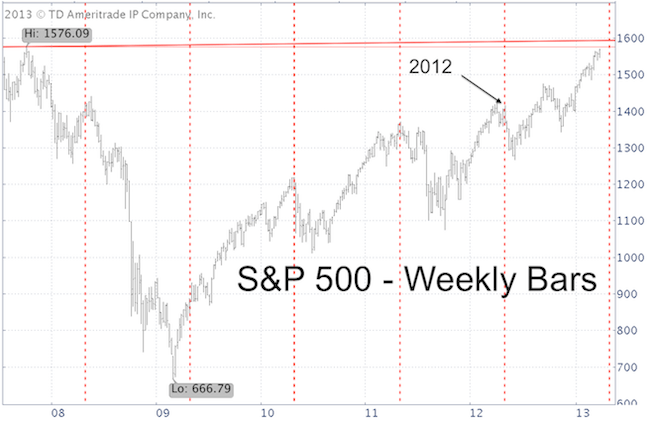 The S&P 500 sprinted into an April/May high and collapsed thereafter. The table below captures more pattern details, such as the May 1 (or closest trading day) high, Q2 high, subsequent low and the May 1 to subsequent low loss. Unfortunately, I’m not the only one to pick up on this pattern. The ‘sell in May and go away’ phrase is already making its rounds. Anytime a certain pattern or reaction is too widely recognized, there’s reason to be suspicious. I’m not suspicious enough to disregard the pattern, but we will use trigger levels to identify low-risk entry levels. 1) The May high usually occurs quickly. There’s a spike higher followed by a quick decline. A slow top (several consecutive dojis) or failure to decline would caution that the pattern will delay or not show. 2) A deep retracement following the initial top and decline may form a double top. We saw this in 2012 (see first chart) and I wouldn’t be surprised to see a mid-April high followed by a secondary May high. The upcoming Profit Radar Reports will deal with any possible changes to the pattern, but for now we expect stocks to maintain a bid for at least the first week of April and rally deeper into the resistance range/target at 1,576 – 1,593 (red lines on chart). 1) A move above 1,577 followed by a close below 1,576. So far the S&P’s price action has meet all the qualifications needed to authenticate the ‘sell in May, go away’ pattern. It does appear that the bearish pattern arrived early. However, the May top has a tendency to appear as a double top, so it’s quite reasonable to expect another assault on the April 11 high over the coming weeks. According to the VIX, option-traders are complacent and have been complacent for many months. The bearish VIX implications however, have not been confirmed by two historically accurate options-based sentiment indicators. The VIX soared 43% on Monday, collapsed 19% on Tuesday and is up nearly 30% today. Just before that, the VIX fell to the lowest reading since February 2007. 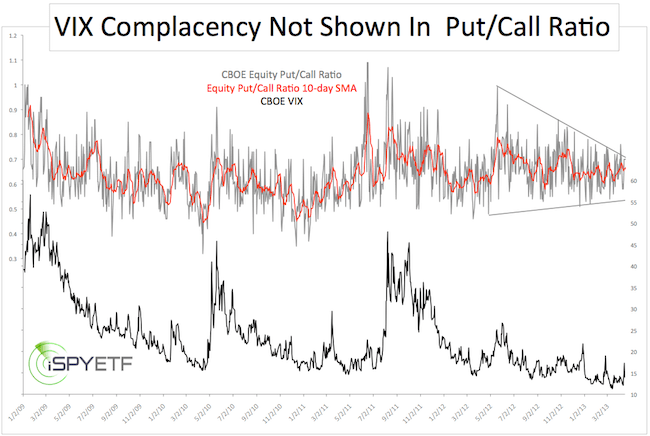 Although the CBOE Volatility Index (VIX) is rushing from one extreme to the next, options traders as a whole have been remarkably ‘non-committal’ or lukewarm from a sentiment point of view. This sentiment deviation is illustrated by the chart below. The CBOE Equity Put/Call Ratio has been narrowing in a triangle shape formation void of extremes. The 2010, 2011 and 2012 market highs were preceded by at least one daily reading below 0.5 and a drop of the 10-day SMA below or at least close to 0.55. The 2013 Equity Put/Call Ratio low was at 0.54 on March 6 (the 10-SMA has yet to fall below 0.6). The recent all-time highs caused no put/call sentiment extremes. Quite to the contrary, the VIX has rushed from one extreme to the next. For that reason, the Profit Radar Report noted back in November that the: “VIX has been of no use as a contrarian indicator and will be put on ‘probation’ until it proves its worth again.” Yes, the VIX is still on probation. The CBOE publishes another options-based index like the VIX, it’s called the CBOE SKEW Index. The SKEW in essence estimates the probability of a large decline. Readings of 135+ suggest a 12% chance of a large decline (two standard deviations). A reading of 115 or less suggests a 6% chance of a large decline. In short, the higher the SKEW, the greater the risk for stocks. The chart below juxtaposes the SKEW against the S&P 500. Last week the SKEW fell as low as 117. This was odd as readings below 115 (dashed green line) are generally bullish for stocks. The CBOE Equity Put/Call Ratio and SKEW index proved to be valuable contrarian indicators in 2010, 2011 and 2012. The current option-trader sentiment is not bullish, but it’s not as bearish as one would expect to see at a major market top. To an extent, option-trader sentiment is in conflict with other bearish sentiment extremes discussed recently. When sentiment indicators conflict, technical analysis and support/resistance levels become even more valuable. As long as prices remain below key resistance, the trend is down until stocks find key support.